Posted on June 6, 2016 by Sean K.
We are thrilled to have a guest post by the amazingly talented artist Sherrie York. 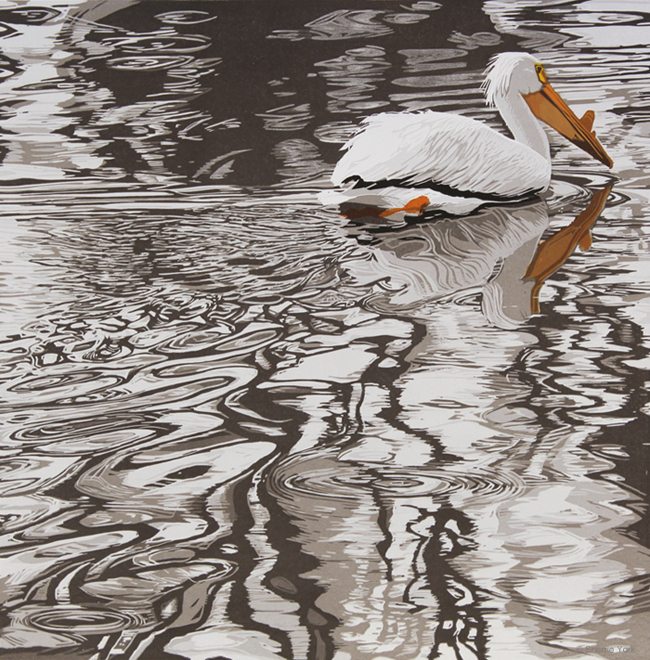 She will be visiting the Museum of American Bird Art at Mass Audubon between July 28 to July 30 to display her art, lead several programs, and give an illustrated talk about her printmaking. She will be doing a workshop with our summer camp on July 28th, giving an illustrated talk and reception for her artwork on July 29th, and giving an all day printmaking workshop on July 30th. Travel and art-making have often gone hand-in-hand. (Or perhaps that’s brush-in-hand.) John Singer Sargent’s watercolors of Morocco revealed an intriguing faraway culture. John James Audubon’s journeys recorded North America’s flora and fauna and Albert Bierstadt’s romantic western landscapes helped inspire the first national parks. I enjoy travel, too, and will be traveling from my Colorado stomping grounds to MABA this summer. 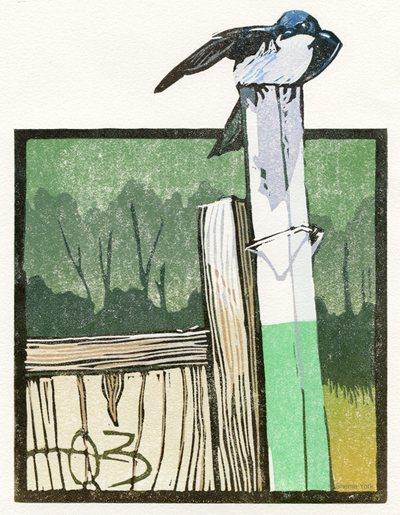 In July I will exhibit some of my linoleum block prints in the estate house and present both a printmaking workshop and presentation about my work. Of course it doesn’t always take a passport, a suitcase, or a new frontier to find subject matter. Familiar places close to home are inspiring, too. This is Sands Lake. 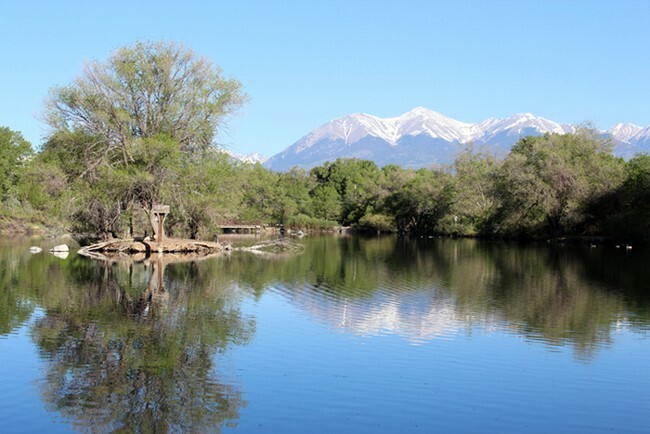 It’s a scruffy little body of water next to the Arkansas River in the town of Salida, where I live. They call it a lake, but it’s really a settling pond for the fish hatchery upstream. Water flows from hatchery to lake via underground culverts, then spills out the far bank in to the river. During the day the trail around the lake is filled with fishing enthusiasts, dog-walkers, joggers, bicyclists, and birders. More than one elicit teenager party has taken place there after dark. Pristine, exotic wilderness it’s not. But for me this humble corner provides a wealth of inspiration and stories year-round, and no small number of linocuts, too. At the upriver end of the lake, next to the inflow culvert, is a concrete fishing pier. The remains of cliff swallow nests were still attached when it was installed, a good indicator of its provenance as repurposed bridge. Hopeful mallards congregate below the pier looking for handouts, and from my elevated vantage point I enjoy watching the tracery they create in the reflection of the railing. Forget the robin as a harbinger of spring! Local birders know that spring migrants begin to appear weeks before the pelicans turn up at the lake, but their sheer size and brilliant whiteness assure that even the most bird-ambivalent will notice this sign of winter’s demise. Like mushrooms after rain, American coots sprout on the surface of the lake in early autumn. The antics of 70 or 80 over-wintering birds amuse me until spring, but before the trees have finished leafing out they are gone. I never see them arrive, and I never see them leave. Winter is the time for waterfowl on Sands Lake. Because so much water moves through from the hatchery the lake remains open even in the coldest days of winter. 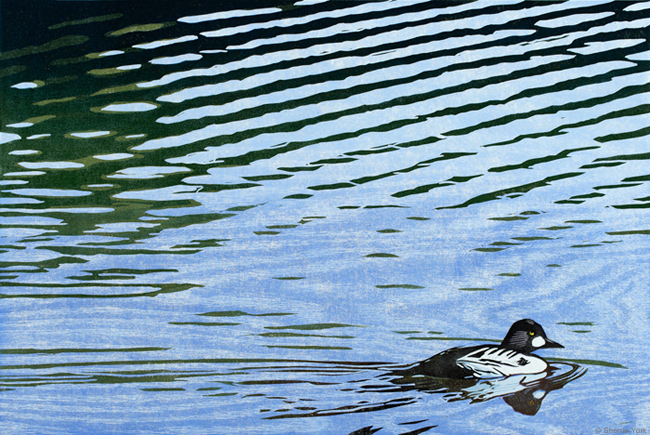 Common and Barrow’s goldeneye, buffleheads, scaup, wigeon, and more fill the lake with noise and motion and offer consolation for the absence of warblers and swallows. 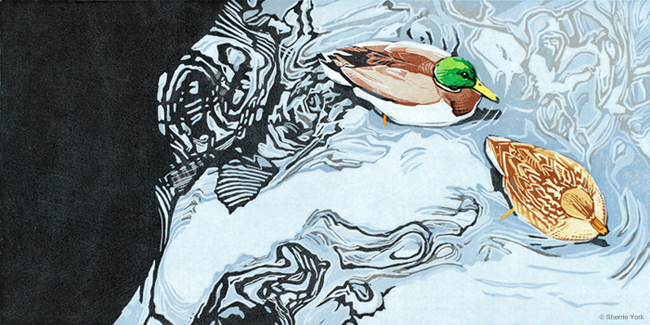 This entry was posted in Art Exhibition, Artists, Education, Lecture Series, Museum, Public Lecture Serices and tagged American Coot, art, Barrow's goldeneye, bluebird, Colorado, Common goldeneye, Linocut, Mass Audubon, Nest Box, Pelican, Printmaking, Sands Lake, Sherrie York, tree swallow, Waterfowl on June 6, 2016 by Sean K..